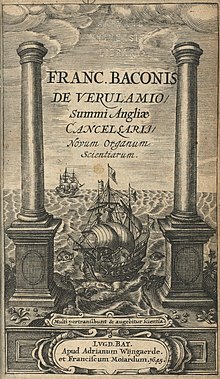 The Novum Organum, fully Novum Organum Scientiarum ('new instrument of science'), is a philosophical work by Francis Bacon, written in Latin and published in 1620. The title is a reference to Aristotle's work Organon, which was his treatise on logic and syllogism. In Novum Organum, Bacon details a new system of logic he believes to be superior to the old ways of syllogism. This is now known as the Baconian method. For Bacon, finding the essence of a thing was a simple process of reduction, and the use of inductive reasoning. In finding the cause of a 'phenomenal nature' such as heat, one must list all of the situations where heat is found. Then another list should be drawn up, listing situations that are similar to those of the first list except for the lack of heat. A third table lists situations where heat can vary. The 'form nature', or cause, of heat must be that which is common to all instances in the first table, is lacking from all instances of the second table and varies by degree in instances of the third table. The title page of Novum Organum depicts a galleon passing between the mythical Pillars of Hercules that stand either side of the Strait of Gibraltar, marking the exit from the well-charted waters of the Mediterranean into the Atlantic Ocean. The Pillars, as the boundary of the Mediterranean, have been smashed through by Iberian sailors, opening a new world for exploration. Bacon hopes that empirical investigation will, similarly, smash the old scientific ideas and lead to greater understanding of the world and heavens. This title page was liberally copied from Andrés García de Céspedes's Regimiento de Navegación, published in 1606. The Latin tag across the bottom – Multi pertransibunt & augebitur scientia – is taken from the Old Testament (Daniel 12:4). It means: "Many will travel and knowledge will be increased". Bacon's work was instrumental in the historical development of the scientific method. His technique bears a resemblance to the modern formulation of the scientific method in the sense that it is centered on experimental research. Bacon's emphasis on the use of artificial experiments to provide additional observances of a phenomenon is one reason that he is often considered "the Father of the Experimental Philosophy" (for example famously by Voltaire). On the other hand, modern scientific method does not follow Bacon's methods in its details, but more in the spirit of being methodical and experimental, and so his position in this regard can be disputed. Importantly though, Bacon set the scene for science to develop various methodologies, because he made the case against older Aristotelian approaches to science, arguing that method was needed because of the natural biases and weaknesses of the human mind, including the natural bias it has to seek metaphysical explanations which are not based on real observations. Novum organum was actually published as part of a much larger work, Instauratio magna—'the great restoration'. Originally intending Instauratio magna to contain six parts (of which Novum organum constituted the second), Bacon did not come close to completing this series, as parts V and VI were never written at all. Novum organum, written in Latin and consisting of two books of aphorisms, was included in the volume that Bacon published in 1620; however, it was also unfinished, as Bacon promised several additions to its content which ultimately remained unprinted. Bacon titled this first book Aphorismi de Interpretatione Naturae et Regno Hominis ('Aphorisms Concerning the Interpretation of Nature, and the Kingdom of Man'). The syllogism is made up of propositions, propositions of words, and words are markers of notions. Thus if the notions themselves (and this is the heart of the matter) are confused, and recklessly abstracted from things, nothing built on them is sound. The only hope therefore lies in true Induction. There are and can only be two ways of investigating and discovering truth. The one rushes up from the sense and particulars to axioms of the highest generality and, from these principles and their indubitable truth, goes on to infer and discover middle axioms; and this is the way in current use. The other way draws axioms from the sense and particulars by climbing steadily and by degrees so that it reaches the ones of highest generality last of all; and this is the true but still untrodden way. These "belong to the particular individual. For everyone has (besides vagaries of human nature in general) his own special cave or den which scatters and discolours the light of nature. Now this comes either of his own unique and singular nature; or his education and association with others, or the books he reads and the several authorities of those whom he cultivates and admires, or the different impressions as they meet in the soul, be the soul possessed and prejudiced, or steady and settled, or the like; so that the human spirit (as it is allotted to particular individuals) is evidently a variable thing, all muddled, and so to speak a creature of chance..." (Aphorism 42). These are "derived as if from the mutual agreement and association of the human race, which I call Idols of the Market on account of men's commerce and partnerships. For men associate through conversation, but words are applied according to the capacity of ordinary people. Therefore shoddy and inept application of words lays siege to the intellect in wondrous ways" (Aphorism 43). The "Baconian method" does not end at the First Vintage. Bacon described numerous classes of Instances with Special Powers, cases in which the phenomena one is attempting to explain is particularly relevant. These instances, of which Bacon describes 27 in Novum Organum, aid and accelerate the process of induction. They are "labour-saving devices or shortcuts intended to accelerate or make more rigorous the search for forms by providing logical reinforcement to induction." Aside from the First Vintage and the Instances with Special Powers, Bacon enumerates additional "aids to the intellect" which presumably are the next steps in his "method." In Aphorism 21 of Book II, Bacon lays out the subsequent series of steps in proper induction: including Supports to Induction, Rectification of Induction, Varying the Inquiry according to the Nature of the Subject, Natures with Special Powers, Ends of Inquiry, Bringing Things down to Practice, Preparatives to Inquiry and Ascending and Descending Scale of Axioms. These additional aids, however, were never explained beyond their initial limited appearance in Novum Organum. It is likely that Bacon intended them to be included in later parts of Instauratio magna and simply never got to writing about them. Bacon is often studied through a comparison to his contemporary René Descartes. Both thinkers were, in a sense, some of the first to question the philosophical authority of the ancient Greeks. Bacon and Descartes both believed that a critique of preexisting natural philosophy was necessary, but their respective critiques proposed radically different approaches to natural philosophy. Two over-lapping movements developed; "one was rational and theoretical in approach and was headed by Rene Descartes; the other was practical and empirical and was led by Francis Bacon." They were both profoundly concerned with the extent to which humans can come to knowledge, and yet their methods of doing so projected diverging paths. On the one hand, Descartes begins with a doubt of anything which cannot be known with absolute certainty and includes in this realm of doubt the impressions of sense perception, and thus, "all sciences of corporal things, such as physics and astronomy." He thus attempts to provide a metaphysical principle (this becomes the Cogito) which cannot be doubted, on which further truths must be deduced. In this method of deduction, the philosopher begins by examining the most general axioms (such as the Cogito), and then proceeds to determine the truth about particulars from an understanding of those general axioms. "Man, the servant and interpreter of nature, does and understands only as much as he has observed, by fact or mental activity, concerning the order of nature; beyond that he has neither knowledge nor power." So, in a basic sense the central difference between the philosophical methods of Descartes and those of Bacon can be reduced to an argument between deductive and inductive reasoning and whether to trust or doubt the senses. However, there is another profound difference between the two thinkers' positions on the accessibility of Truth. Descartes professed to be aiming at absolute Truth. It is questionable whether Bacon believed such a Truth can be achieved. In his opening remarks, he proposes "to establish progressive stages of certainty." For Bacon, a measure of truth was its power to allow predictions of natural phenomena (although Bacon's forms come close to what we might call "Truth," because they are universal, immutable laws of nature). Before Bacon where else does one find a meticulously articulated view of natural philosophy as an enterprise of instruments and experiment, and enterprise designed to restrain discursive reason and make good the defects of the senses? Where else in the literature before Bacon does one come across a stripped-down natural-historical programme of such enormous scope and scrupulous precision, and designed to serve as the basis for a complete reconstruction of human knowledge which would generate new, vastly productive sciences through a form of eliminative induction supported by various other procedures including deduction? Where else does one find a concept of scientific research which implies an institutional framework of such proportions that it required generations of permanent state funding to sustain it? And all this accompanied by a thorough, searching, and devastating attack on ancient and not-so-ancient philosophies, and by a provisional natural philosophy anticipating the results of the new philosophy?" ^ Cañizares-Esguerra, Jorge (2004). "Iberian Science in the Renaissance: Ignored How Much Longer?". Perspectives on Science. 12 (1): 86–124. This page was last edited on 12 March 2019, at 08:09 (UTC).